bread | I'm Gonna Cook That! I don’t know why I’m so fascinated with the thing I’m so not very good at, but here I go again, starting another baking project. Did I tell you guys I made gingerbread cupcakes in class last week, and when they sunk in the middle I cried? Yeah, I know that school is for learning and learning means messing up, but this is something I’ve made at home before a few times and never had an issue and I was just so upset about it I made a big ole fool of myself. Snotty and red faced and the whole nine. But then three different chefs came over and gave me pep talks, really good ones, and I’m over it now. Mostly. If you’re not familiar with bottle dregs, here’s the scoop. 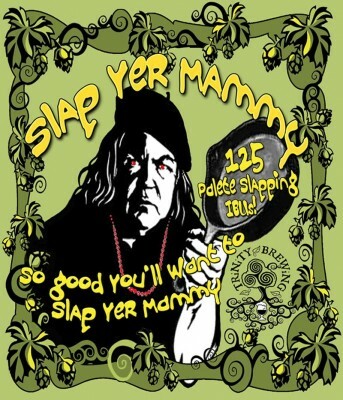 Sometimes, you’ll drink a beer that has “stuff” floating in it. Usually, unless you shake up the liquid, the stuff sinks to the bottom of the bottle and never makes it to your glass. Contained within that stuff, the dregs, are bacteria and yeast that were used in the beer making process. 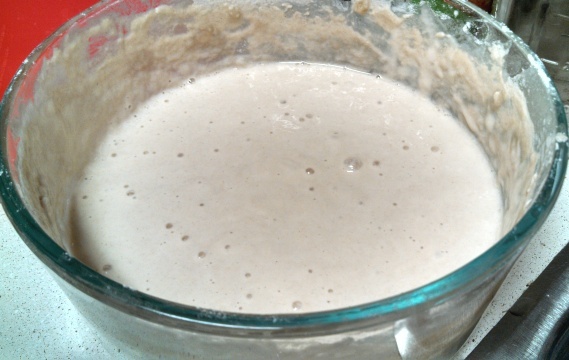 Those dregs still have live “bugs” in them, and can be reused to make more beer, or, in this case, give a sourdough starter a big ole kick start. To make mine, I used the basic process laid out here, at thekitchn.com. They do a great job of explaining what a starter is, and why you’d want to make one, but I’ll give you the Reader’s Digest version. 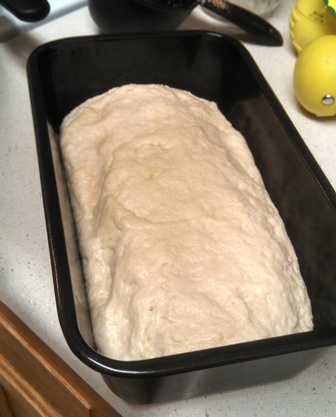 When you make bread, you need a leavening agent to make it rise. Most of the time, you’re going to go to the store and buy the yeast that has been grown and cultivated specifically for the purpose of baking. You don’t have to corral all those little yeasties yourself because someone has done it for you. 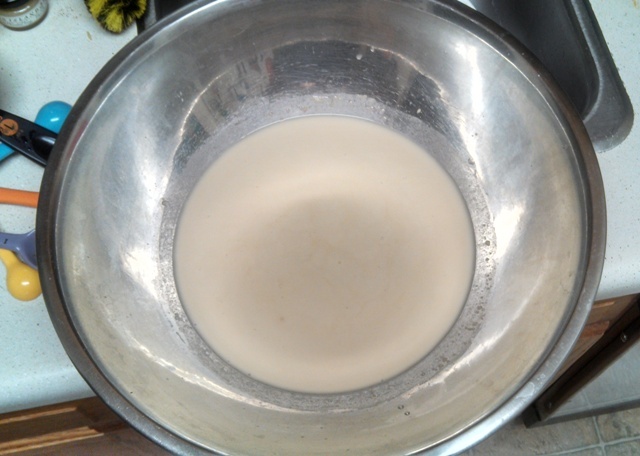 Essentially, by growing your own starter, you’re creating a medium in which you can cultivate and grow all the wild yeast that’s already in the flour to use as your leavening agent, versus using the stuff from the store. 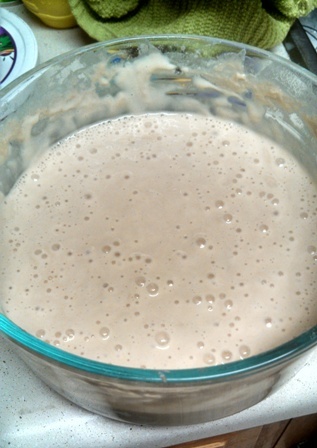 I started with a 1:1 ratio of flour to liquid– 4 oz. 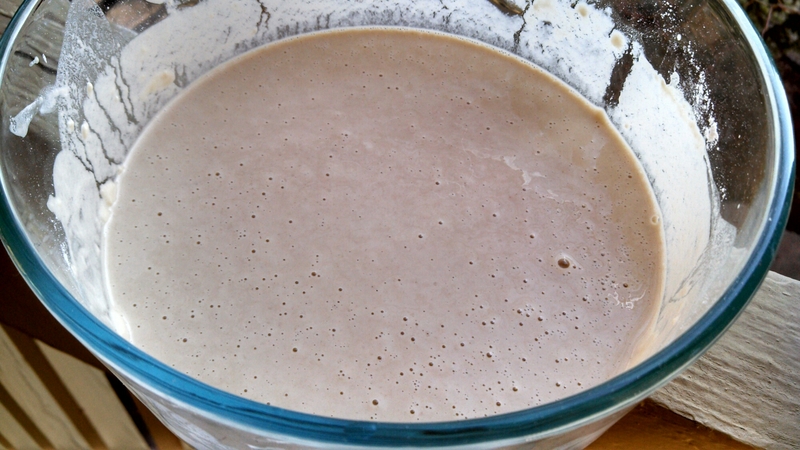 flour, and 4 oz of a combination of the bottle dregs and water. The moment I put the two together, I already started to see bubbles. That’s a good sign. 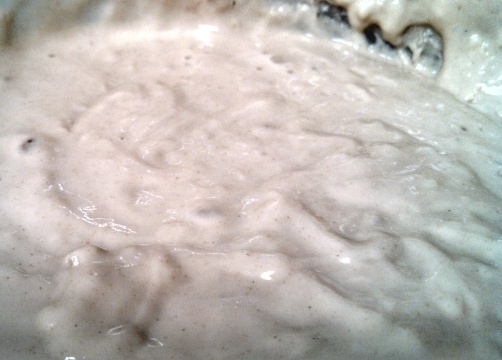 It’s a little hard to tell, but it’s starting to get frothier and just generally gooey. It also smells kinda sour at this stage (duh), and at day five, closer to being ready to use, I can also smell that lovely yeasty smell. What you don’t want to smell is acetone. If you smell that, it means things have gone a little sideways and you probably need to start over. 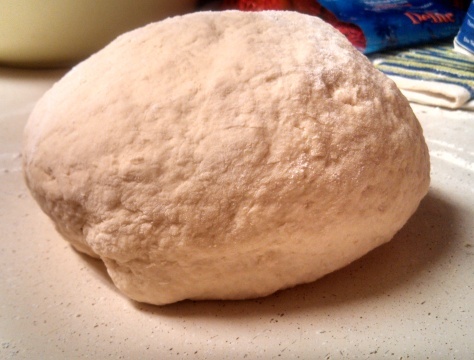 But, as long as you feed it every day, and store it in a spot with a consistent temperature of around 70°F, in about 5 days you should have a healthy starter that you can use to make everything from bread to pizza dough. 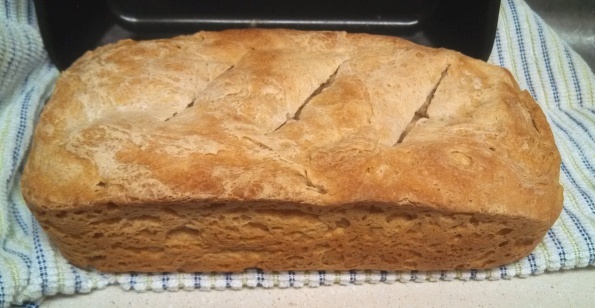 I’m in school for the next three days, so the first opportunity I’ll have to test out my starter in a loaf of bread will be late Friday evening. Of course, I’ll take pictures and tell you how it goes. Have you ever made your own starter? How do you use it? Leave a comment and let me know!